Picking creative ideas for corporate gifts is something we get asked for a lot so we decided to create a round-up of some of the ideas that seem more popular than others. One thing that's worth keeping in mind when selecting giveaways for a trade show or an exhibition is that above all else the product you choose should represent your company well in terms of quality, category and style. Secondly, the gift should either be practical for your clients to use in everyday life or it should be gimmicky enough to be a great talking point that will be kept just for its fun factor. Finally, a lot of products can be made into creative giveaways with the artwork and design that you choose to include on it. Even a plain gift can be exciting with a creative tag line or engaging photography. If you're still stuck for ideas, consider the five product we decided to shortlist below. One way of giving people a cool gft is to unilise the latest trends in novelty gifts. Fidgets came into the market by storm, and now, nearly every school kid has at least one. It is a gadget that has a clever spinning mechanism which means that the three prongs spin almost endlessly with the gentlest of puches. 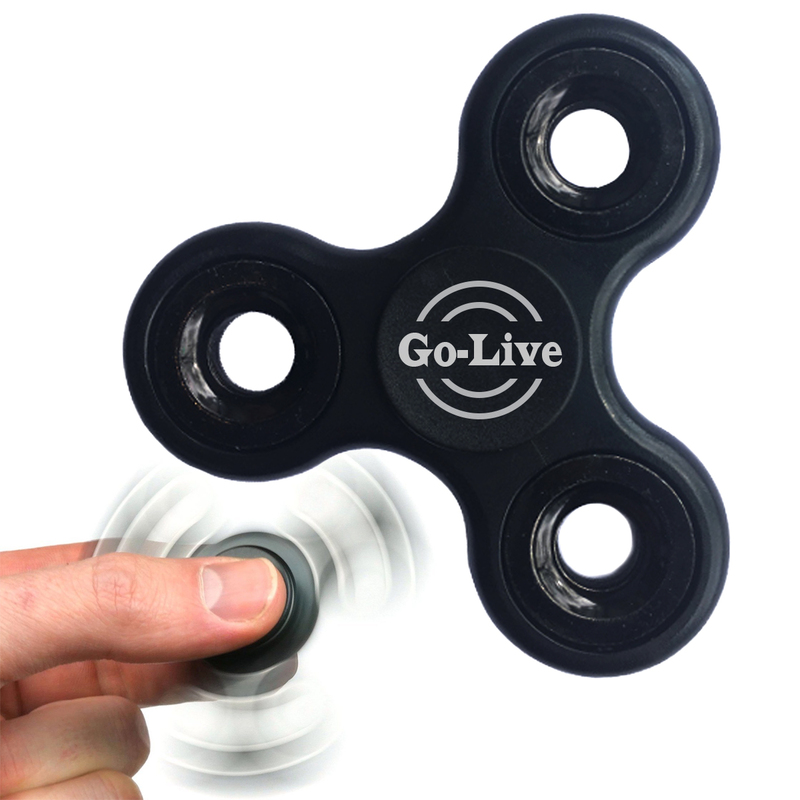 It's an addictive litttle thing that will keep your customers excited and eager to demonstrate their spinning skills to others. We can print the promotional fidget spinner on the circlular area in the middle in up to 2 spot colours. If you have a full colour logo, we recommend having a 3D dome attached in that same place. If you like a novelty toy idea, other gifts you could consider are syringe pens, virtual reality glasses or selfie sticks. Brand this product with your logo. Another playful item that is popular at summer events are printed sunglasses. Promotional sunglasses are available in many colours and can be printed with your logo on both arms. They are available in a few fashionable styles to complement your brand and provide the perfect background for your logo. 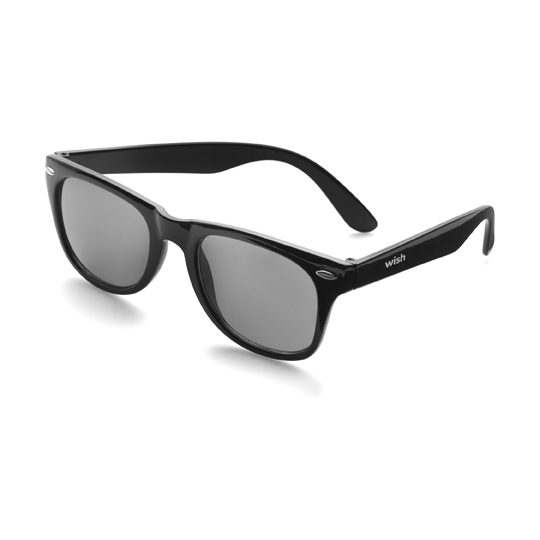 People who receive promotional sunglasses at an event will wear them there and then (especially if it's an outdoor event and the sun is shining). They are also likely to keep them and use them again in the future. Somewhere between a gadget, a fashion item and a piece of apparell, branded sunglasses are versatile in their appeal and will apply to many marketing situations. Alternatively, if you're worried about classic British weather messing with your event ambiance, why not opt for plastic ponchos or umbrellas? As events are, naturally, full of people and a lot of touching, some visitors might be worried about extra dirt and germs. You can be seen as a caring and thoughtful brand if you supply visitors with pocket hand sanitisers. That way, they can wash their hands quickly and with no hassle. Hand sanitisers can come in several different forms: in pouches, pens, tubes, sticks or card sized containers. They can then be printed with your logo and website address or telephone number. Hand sanitisers are particularl handy (excuse the pun!) at events involving exibiting merchandise that can leave bits on your skin, e.g. in construction, with food, or with cosmetics. Once products have been tested or sampled, a little pouch, tube or plastic container can provide a much wanted relief. If you have a little extra cash to spend on a corporate giveaway that will be appreciated and kept for a long time, why not choose a promotional power bank? These gadgets come in plastic or metal cases and can be printed or engraved with your logo, depending on the specific style. They all come supplied with a charging cable and packed in a cardboard box. This means they are easy to give away. Your visitors will thank you for such a useful gift that will save any phone or tablet from running out of battery life. Power banks' prices usually depend on how powerful they are - so the cheaper options will take longer to charge a phone and will provide enough energy for one or two charges. More expensive and more powerful varieties can store enough power to supply a phone a number of times and they can even charge two devices at the same time. Event visitors might want to get hydrated so why not be there to satisfy that need? Products that cater to specific needs of your customers are most appreciated. A long day out means that people will need to stay hydrated. You can offer them a glass of water, or even better, a water bottle that they can take with them and keep refilling! 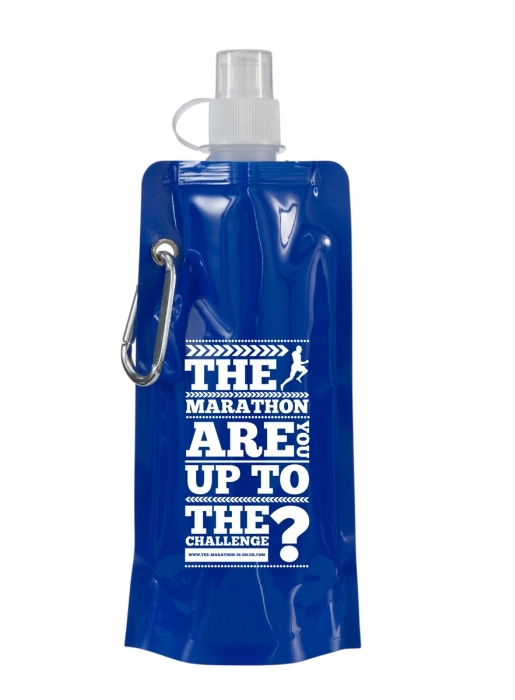 Our favourite is a foldable water bottle with a carabiner keyrinng. It's reusable and it provides a great print area for your logo. Choose from a number of colours. This bottle could even be used by your visitors for many months to come! Once you've picked the style and value of your gift, it's great to think about what your visitors could use at the event itself. This should give you some ideas on what could come in handy. We hope you loved the ideas above. Get in touch if you'd like to use any of them to distribute at your next event! Are you stressing out over the decision of choosing a corporate gift to represent your business? These three easy steps will help you come to a strong, well-reasoned decision in no time at all. When employees or clients are retiring it's appropriate and will reflect positively on your brand to give them a generous retirement gift. Here are 10 suggestions for gifts that will make men feel valued and appreciated. Loyalty programs are an effective way of retaining customers and increasing revenue. Read how you can design a scheme that utilises corporate gifts and makes your customers feel valued. 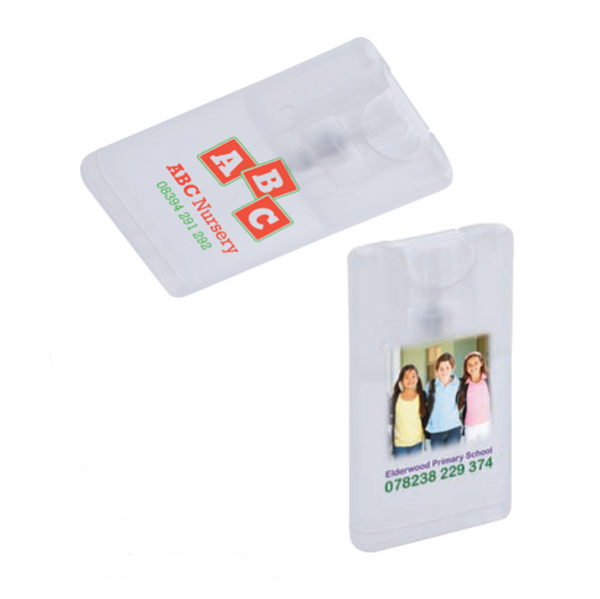 From mouse mats to screen cleaners, promotional office items are always in demand. Our top 10 most effective and popular office gifts are listed here - choose your favourite! How Does Discreet Branding on Corporate Gifts Win Over Customers? 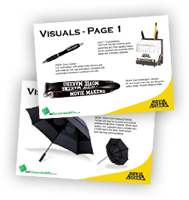 Promotional products can be branded to be either 'loud' or subtle, eye-catching or elegant. Both approaches work but discreet branding brings some particular advantages which are listed here. Product launch events are a great way to create a buzz around a new product, and you can make these events even more exciting by using promotional freebies and giveaways. 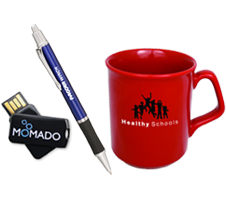 Find out how to choose the best promotional products for your event.